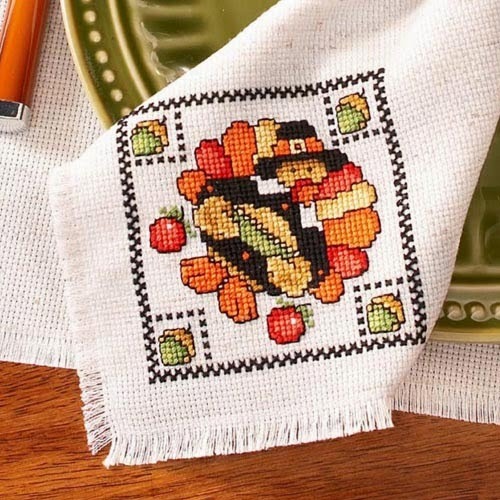 This week's free cross stitch pattern is actually a straight Thanksgiving design. But I'm posting it a few weeks earlier, so you can actually use the design this year (if you stitch fast!). I first came across this turkey Thanksgiving design by Joan Elliott in a back issue of Cross Stitch and Needlework magazine. It was part of a 3 piece set, but the napkin design was my favorite of the three. So when I came across the pattern for free from the Herrschners website, I knew I needed to share it with you all. As much as I liked the pattern from the magazine, pattern copyright is an issue I deeply respect, so I couldn't share it unless it had been offered by the publisher for free. Which it is right now at least, and it makes me very happy. I just love Joan Elliott's designs! Head over to Herrschners to download the PDF of this free cross stitch pattern and spice up your Thanksgiving table a bit (pun not intended). If you ever come across one of my posts that contains a chart that breaks copyright law, please email me and let me know right away. In picking and posting my free cross stitch pattern posts, I make every effort to ensure the designs I share are legitimately free charts.